September 4, 2011 (San Diego)--Since Ben Franklin organized the U.S. Postal Service, the mailman has been a fixture in U.S. culture. But now the internet and private delivery service has forced the U.S. mail into a deficit. Thousands of small Post Offices are closed, and many rural communities are losing their common connecter of culture. September 1, 2011 (El Cajon) -- El Cajon Police Chief Pat Sprecco is happy to announce that Officer Jarred Slocum, critically injured during the shooting and fire incident on August 21st, at 1033 Prince Street, was well enough to be released from the hospital on Monday. August 31, 2011 (Pala) -- The Pala Fire is now 100% contained, Cal-Fire spokesperson Roxanne Provaznik confirms. Total cost to fight the fire exceeded $1.8 million. Total acreage burned is estimated at approximately 233 acres. The acreage has been down-sized from earlier estimates due to more accurate mapping, according to Cal Fire. 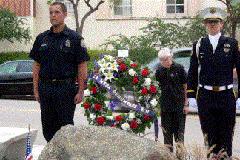 August 31, 2011 ( San Diego) – The San Diego Police Officers Association, Inc. (SDPOA) is grieving the loss of Officer Christopher Blakeley, who died in an off-duty motorcycle accident on Aug. 24. August 30, 2011 (Julian) – Beautiful, historic Julian is an enjoyable place to experience art galleries and shops selling local artists’ works. This weekend, the Julian Art Guild hosts a Labor Day show that brings together numerous artists in one place on September 2-5 from 10 a.m. to 5 p.m. at the Julian Town Hall, upstairs, on Main Street. August 31, (San Diego) -- There will be a special meeting of the San Diego County Board of Supervisors on September 6, 2011. The meeting will be held to discuss the 2011 Supervisorial redistricting alternatives. The meeting is at 2:00 p.m. in room 310 of the County Administraton Center located at 1600 Pacific Highway, San Diego. Aug. 28, 2011- Sweltering heat couldn’t keep East County wine lovers from kicking off this year’s grape harvest at San Diego’s award winning Orfila Vineyards and Winery’s 18th annual grape stomp in Escondido’s San Pasqual Valley yesterday. Roughly 420 people channeled their inner vintner by stomping freshly picked grapes with their bare feet, leaving many astounded with the sheer gooey nature of the after product. Update 5 p.m. - All fires are out and traffic is flowing as firefighters douse remaining hot spots. August 30, 2011 (Pala) - The Pala fire is 60% contained, with full containment expected today and complete control by tomorrow at 6 p.m. Thus far costs to fight the 300+ acre fire have exceeded $404,000, according to Cal-Fire spokesperson Roxanne Provaznik. August 30, 2011 (Julian) -- Every September, the Julian Chamber of Commerce celebrates the harvest of the town’s grapes with a real, Old World-style grape stomp and festa at the Menghini Winery September 3 from 11 a.m. to 7 p.m. This grape stomp provides two barrels for stomping--one for adults and one for children. Update 9 p.m. - The forward spread of the fire was stopped at 75 acres (downgraded from earlier estimates on acreage). A total of ten engines, 4 fire crews, 2 airtankers, 3 helicopters, 1 bulldozer, 2 water tenders, 3 Chief Officers and 100 firefighters have worked to battle the blaze, Cal-Fire reports. August 28, 2011 (City Heights)—A shimmering dragon marched past, trailed by followers beating cymbals and carrying glow sticks. Hundreds of lanterns glowed softly against the night sky, accentuated by the streaming lights of carnival rides. I sampled Thai chicken-on-a-stick, along with fried bananas and yams—all at the third annual Lantern Festival in City Heights. Update 11 p.m. – The Pala Fire is now 40% contained. A Red Cross Evacuation Center is set up at 12194 Pala Mission Road at the Jim Banks Sports Complex. Evacuation advisories have gone out to an additional 79 homes this evening within the following Thomas Bro. map pages/grids: page 999, grids G2 through G5, H2 through H5, J2 through J5 Page 409, D5 and E5 Total 79 numbers. August 27, 2011 (San Diego’s East County) – As I write this, the stock market is up.... sorry it's down... oops, I mean up.... no, it's down..... Yup, we are once again on that wacky roller coaster ride called, "The Economy." While many businesses see this rock 'n' roll economy as a reason to cut back or eliminate marketing, I contend that is a knee-jerk response which will probably cause more problems than add to the bottom line. August 28, 2011 (Julian) – The women of Julian have a long and proud history of community service dating to 1926, when Ada Hildreth gathered some of her friends and neighbors to form the Julian Woman’s Club, a chapter of the national Greater Federation of Women’s Clubs. August 24, 2011 (San Diego) -- The Little Saigon Foundation, a local non-profit, hosts its second annual San Diego Lantern Festival and Street Fair August 26-28. Attendance is expected to be 20,000 – 30,000 guests. This year’s theme is “Light Up San Diego” and will feature nearly 6,000 traditional silk lanterns.